The system Suspense, made of Haver Architectural Mesh, is the ideal concept for suspended ceilings that creates new standards for individual interior design. Two and three-dimensional forms can be realised with the exactly coordinated components of pre-finished stainless steel mesh elements and a filigree substructure. Due to the selection of different mesh types, there are almost no limits in the design of ceiling lining. In addition to an exceptional aesthetic, the suspended ceiling system features durability, easy installation and low maintenance. 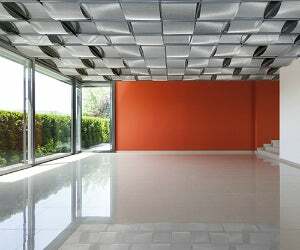 The ceiling system by Haver & Boecker is an attractive solution, not only for renovation and modernisation projects. Conves: the preformed mesh elements are convex inserted into the ceiling system Suspense. Ondula:the preformed mesh elements are alternating inserted concave/ convex into the ceiling system Suspense. Plano: the preformed mesh elements are inserted lying flat into the ceiling system Suspense.